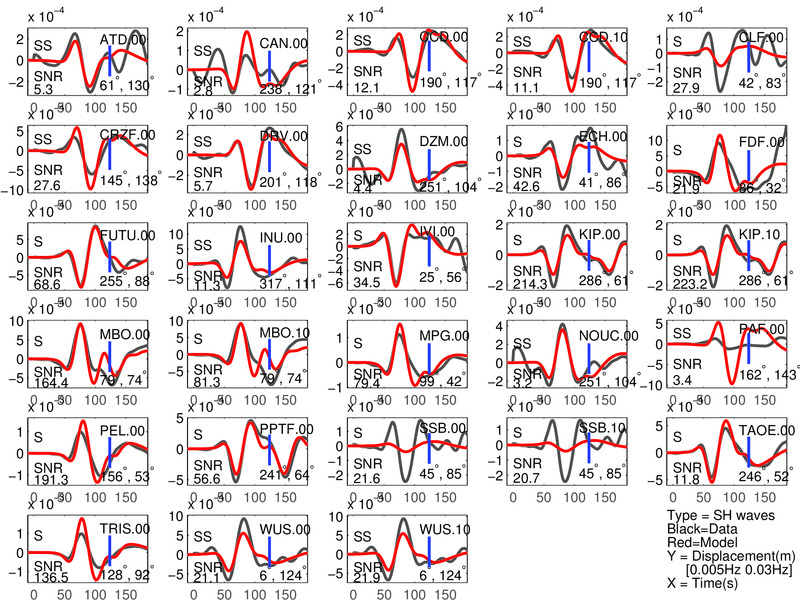 SCARDEC method uses the teleseismic body waves to retrieve the depth, focal mechanism, moment magnitude and source time function of earthquakes with magnitudes larger than 5.5-6. Details of the methodology are described in Vallée et al. and an application to all earthquakes with magnitude larger than 6 in the period 1992-2011 can be found in Vallée . 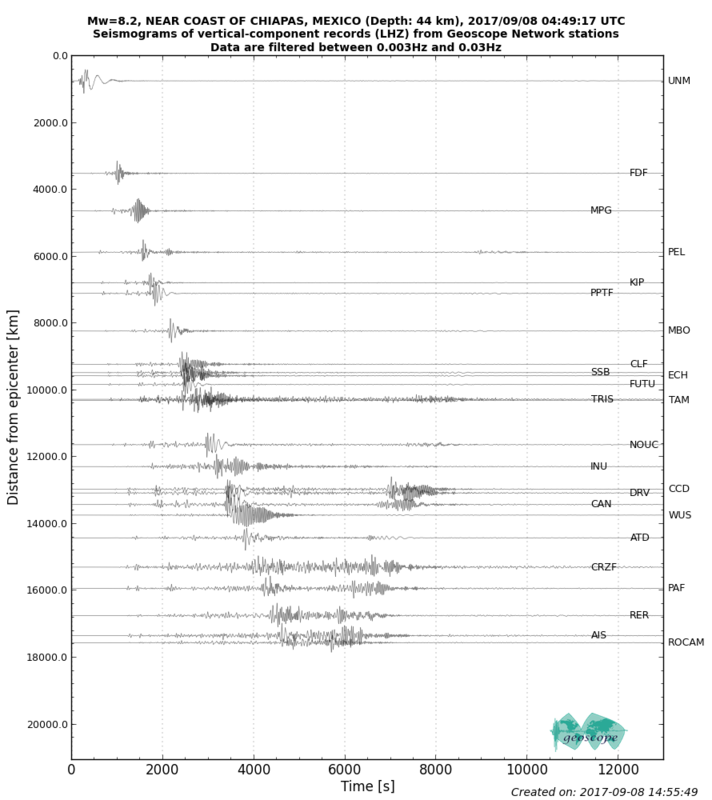 This method has originally been developed at Geoazur laboratory, where the near-real time analysis of the earthquakes in the period 2011-2013 is available here. In the near-real time configuration presented here, the solution is typically posted 45 minutes after earthquake occurrence. Solution includes a map summing up the SCARDEC results and a figure showing the agreement to the data. The map presents the earthquake location (together with the plate boundaries from Bird  and the slab contours of SLAB 1.0 [Hayes et al., 2012]) and the main SCARDEC source parameters. Numerical values of focal mechanism parameters and seismic moment are written below the map. The data agreement figure compares the SCARDEC synthetics (red) with the FDSN data (black), in the frequency range used for focal mechanism determination. The name of GEOSCOPE stations is written in green. See more information (about the data, the procedure, the reasons that could prevent from providing the earthquake information, the source time function determination...) in the "detailed notes" . (1)	Vallée, M., J. Charléty, A.M.G. 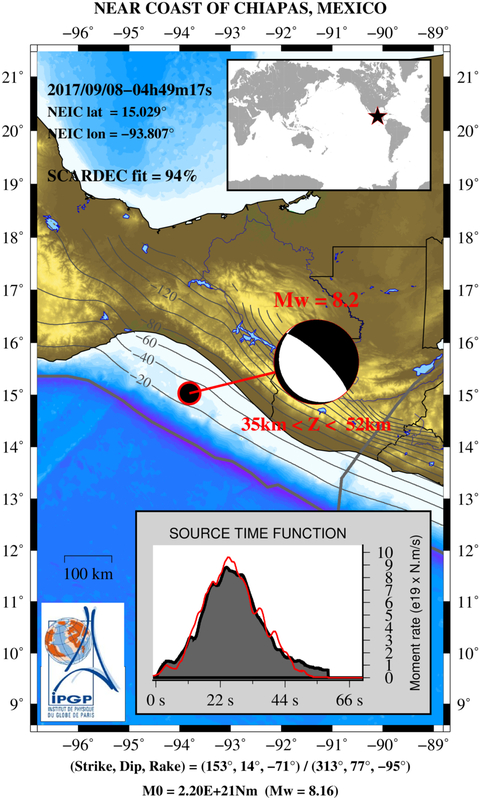 Ferreira, B. Delouis, and J. Vergoz, SCARDEC : a new technique for the rapid determination of seismic moment magnitude, focal mechanism and source time functions for large earthquakes using body wave deconvolution, Geophys. J. 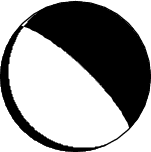 Int., 184, 338-358, 2011. (2)	Vallée, M., Source time function properties indicate a strain drop independent of earthquake depth and magnitude, Nature Communications, doi: 10.1038/ncomms3606, 2013.
is used for drawing some maps of the webpage. 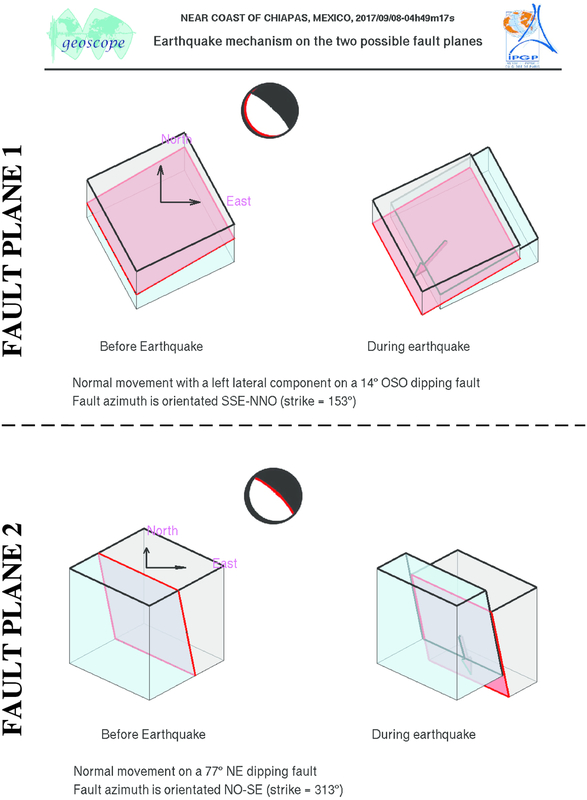 This figure illustrates how the two blocks separated by the seismic fault are displaced during the earthquake. These movements are deduced from the SCARDEC focal mechanism, on the two possible fault planes. Additional information (tectonics, near-fault measurements) is required to determine which one of these two hypotheses corresponds to the real movements during the earthquake. 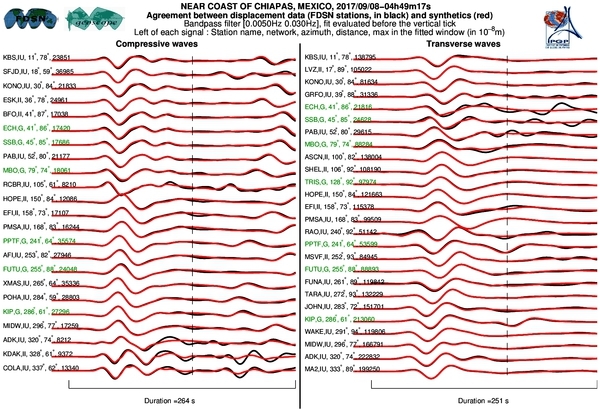 Note: This part has been developed for diagnostic of Geoscope data in real-time ; data shown here have not been validated, and differences between data and synthetics should be interpreted with caution, in particular for moderate earthquakes (magnitude < 6.2) and very large earthquakes (magnitude > 7.5). The SCARDEC solution is used here to predict the waveforms at all Geoscope stations received in real time and located at distances between 30° and 150° from the earthquake. All available location codes are used, for the BH* channels. In the range [30° - ~90°], the prediction is done on P and S(H) waves and in the range [~90° - 150°], it is done on PP and SS(H) waves. See agreement for P or PP waves (vertical components) between data and synthetics in Figure 1; see agreement for S(H) or SS(H) waves (horizontal components) between data (black) and synthetics (red) in Figure 2. Tables 1 and 2 provide quantitative estimates of these agreements. Figure 1: Agreement between data (black) and synthetics (red) for P or PP waves (the type of waves used is indicated in each subfigure). The comparison is shown with a time shift (noted 'Dt1' in Table 1), corresponding to the optimal fit ('Fit1' in Table 1) before the blue tick. Also indicated are the azimuth and distance of the station, and the signal to noise ratio (SNR). 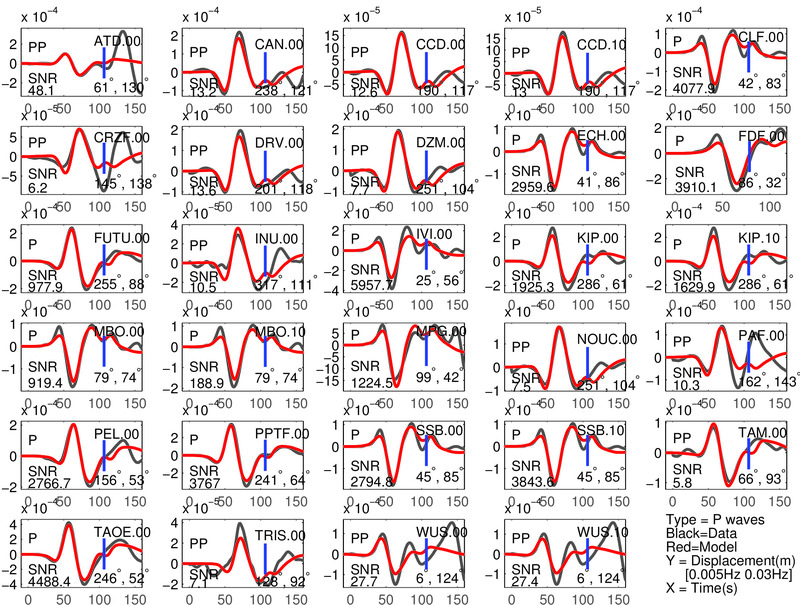 Note that the prediction done for PP waves is expected to be less accurate than the one for P waves. 'Fit2' is the variance reduction allowing an optimal time shift ('Dt2') and an optimal amplitude normalization ('Corr_Amp'). The latter value is the factor by which data should be divided to be the closest to the synthetics. 'Comment' column is filled when the data and/or the comparison between data and synthetics are not as expected. Figure 2: Same as Figure 1, but for S(H) or SS(H) waves (use of the rotated horizontal component along the transverse direction). See in Table 2 the quantitative estimates ('Dt1' and 'Fit1') corresponding to this Figure. Table 2: Same as Table 1 for S(H) or SS(H) waves. This page gathers information on earthquake characteristics (through the SCARDEC method, see below) and on GEOSCOPE data available for these events: The “data” tab provides access to the data seed file (20000s window starting at the earthquake origin time), provides access to the theoretical arrival times, shows earthquake waveforms for each station and channel, and presents the global Earth wave propagation through the visualization of the LHZ channel. The “mechanism” tab illustrates the geometry of the movement during the earthquake, along the two possible faults planes determined by SCARDEC analysis. Several e-mail alerts are available, as soon as a new earthquake has been analyzed: (1) for all earthquakes, (2) for earthquakes with Mw>=6.5, and (3) for earthquakes with Mw>=7. Please contact Martin Vallée (vallee@ipgp.fr) to be added in one of these mailing lists.